You would not BELIEVE the trouble I had getting a picture of this card. I hate it when something doesn't work properly, so when our camera decided to die half way through a photo shoot, I well and truly threw my rattle out of my pram! So, I apologise for the slightly naff and quite bright photo. The new Challenge over at Squiggles and Giggles is Go Dotty, so, with my love of spots, you can imagine how happy I was about that. I've used Lilliputs Pirate Boy, because he's one of my favs! fabby card Faye...so crisp and clean!! Another gorgeous card Faye - I love it. I love this card Faye,great image and fab spots and dots. Very cool Pirate card ! Super cute card Faye. I love polka dots. There must be more toys on the floor now than in your pram!! Honestly...where's Sweet Cheeks when you need him to tidy up? this is so stinkin' cute! 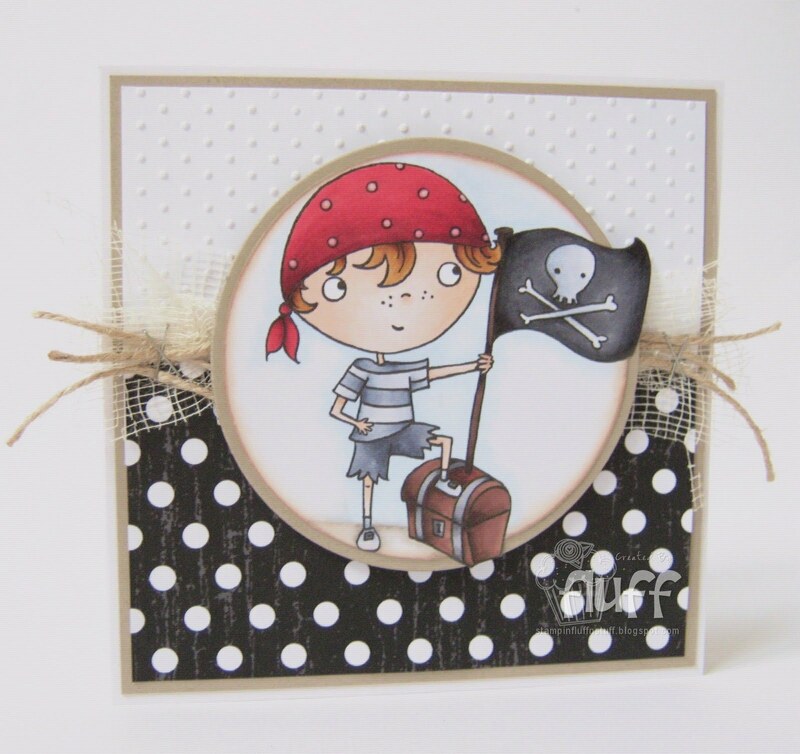 Love the pirate paired with polka dots! What are you talking about? Both the photo and the card are fab! Loving that little pirate boy, so cute. Fantastic card sweetie...such a brilliant image & love the dots!! ... here it is! Ahoy! Clean and simple, but simply beautifull! Does he hold Mollie in this chest? Still have to go treasure hunting for Mollie.. Aargh! !